The Burning Nights CRPS Support 5th Annual National CRPS Conference is now announced for 2019! This year is the 5th year that Burning Nights CRPS Support has run it’s very successful annual national Complex Regional Pain Syndrome conference. Our 5th Annual CRPS conference will be held at the DoubleTree Hilton Bristol North. This annual CRPS conference is mainly for CRPS patients, their families and friends to help support them and to help their understanding of the condition, treatment options and more. The conference is also available to health professionals, however in the first instance it is for the support of CRPS patients, their families and friends. 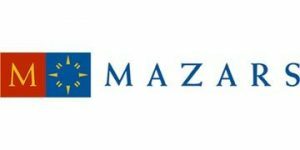 This year our 5th Annual National CRPS Conference is being supported by Mazars LLP. It is with the extreme kind generosity that we have been able to keep our CRPS conference free of charge for CRPS patients and their families. Thank You to Mazars LLP! This year our CRPS conference is being held on SATURDAY 2nd NOVEMBER 2019 and will be at the DoubleTree Hilton Bristol North. If you’re interested in coming along to our 5th Annual National Burning Nights CRPS Support Conference at the DoubleTree Hilton Bristol North, please fill in the RSVP box below this event and event details. We start at 9.30am and finish around 4.00pm / 4.30pm. However you are able to come and go as you wish. Lunch and refreshments will be included free of charge. Both lunch (sandwiches including vegetarian option, salad bar and fries) and refreshments are FREE (for CRPS patients and their families) for you during the day’s event. The DoubleTree Hilton Bristol North is deemed a disabled friendly hotel. The conferencing area has both a separate entrance to the hotel and you can also access the conference facilities via the main hotel. This is a flat area which is suitable for wheelchairs and scooters. There are accessible toilet facilities in the hotel and also in the conference area. The hotel is easily accessible from both the M4 and M5 motorways and is also only 8 miles from the city centre. There are parking spaces available at the hotel and this includes a limited number of Blue Badge spaces. There are obviously not a large number of these places available. We have also managed to get parking included for the event. As we mentioned at the beginning, this year’s 5th Annual National CRPS Conference is being very kindly sponsored by Mazars LLP. It is with their generosity that we can keep the annual national CRPS conference free of charge for CRPS patients and their loved ones. Our line up of speakers is now coming in and so far the following have confirmed. Our speakers will always have working knowledge of Complex Regional Pain Syndrome, living with CRPS or disability due to CRPS. Chris has worked for the Motability scheme for a number of years. Motability is the scheme for disabled people to be able to get cars and adaptions through the scheme as part of their PIP benefits. Chris will be talking about the Motability scheme, how it works and who can use it. Andrew is a Personal Injury lawyer with BLB Solicitors, with many years of experience of dealing with Complex Regional Pain Syndrome legal claims. BLB Solicitors have a separate chronic pain legal department and a regular blog. They are also part of the charity’s legal panel. We are also looking for both CRPS carers and CRPS patients who would be interested in giving a short talk about their lives either living with CRPS or as someone who cares/loves for someone with CRPS. If you’d like to speak at our 5th Annual National Burning Nights CRPS Support Conference please get in touch with us and let us know. If you’re a company or clinical researcher and would like to exhibit at our 5th CRPS conference. We have spaces available. If you would like to discuss the options available please get in touch with our Founder, Victoria. We only have a limited number of 110 places for our very popular annual national CRPS conference, so get your free tickets early to avoid any disappointment! If you decide after you’ve ordered your tickets that you no longer want to go please contact us as soon as possible because we will have many people on our cancellation list. We ask that you keep to 4 tickets per CRPS patient to enable others to join us. If you would like to stay at the hotel, their phone number is 01454 201 144. If you book online why not sign up for Easy Fundraising and help us raise FREE donations just by booking your hotel online or buying anything online! As is usual there are very limited Blue Badge disabled parking spaces at the hotel. But there are a number of car parking spaces available at the hotel. Interested? Have any questions or you can contact us by email, phone or on social media. If you want to order your FREE tickets then please complete the RSVP box above! 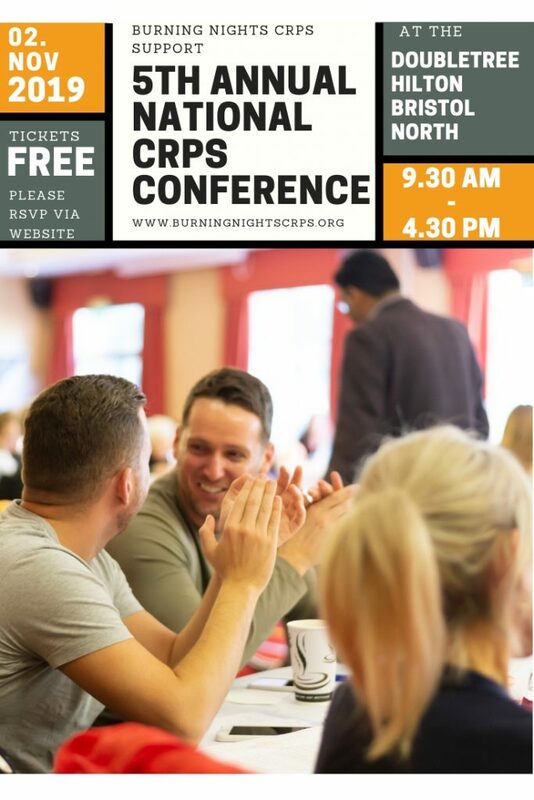 We look forward to meeting you all there for our 5th Annual National Burning Nights CRPS Support Conference on Saturday 2nd November 2019! Why not bring your family or friends with you? Don’t forget to share our CRPS conference on social media using the sharing buttons below!